Digital technology gave us a major advance by making it possible to change tempo without changing pitch, or change pitch without changing tempo. Curiously, though, there aren’t as many options if you want to change both simultaneously. Fortunately, Studio One can do this easily. The key is the Inspector’s Speedup and Tune parameters. A speedup of 2% is about right for making a noticeable, but not obvious change; however many older masters were sped up a lot more than that, so don’t feel too constrained. For Tune, 20 cents works well as a general-purpose setting but again, there are no rules about this other than to use your ears. If you enter these changes and then go back to 0 for the two settings, the song will sound less lively. However it’s important to acclimate yourself to any changes, either speeding up or “bypassed,” before making any final decisions about what sounds best. Note that I much prefer to do any master speed/tune change processing on the finished, two-track mix instead of while working on a song. That way I don’t need to remember to set the Speedup and Tune on each track, or render loops so I can use the needed parameters. 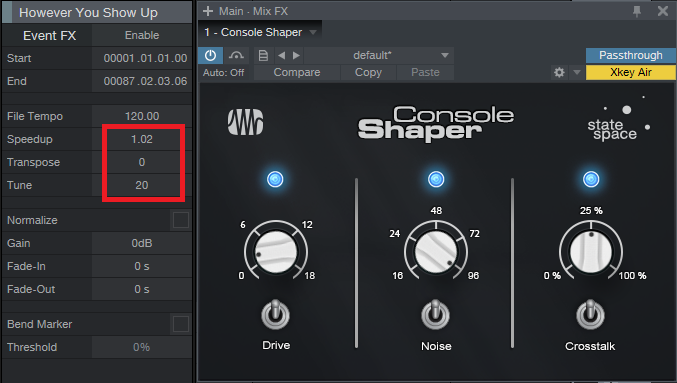 And since we’re in old school territory, consider adding a bit of Console Shaper as well from the Mix FX drop-down. I seldom push drive above 9 o’clock for program material, and some crosstalk makes the sound a bit more speaker-like when wearing headphones (with headphones, you don’t get acoustical crosstalk like you do with speakers, where the left ear hears some of the right speaker, and vice-versa). As to noise…well I’m not a fan of noise, but with some tracks, it does add a little “glue.” Or maybe it just triggers the psychological response of working with older gear. The audio example plays an excerpt from the remix of “To Say No Would Be a Crime” (from my album “Simplicity”). The first 19 seconds are the original version, the rest of the example speeds it up by 1.02 with a pitch increase of 40 cents. The complete song is available on YouTube/thecraiganderton. In any case, when you want your music to be a little more lively, brighter, and tighter, try raising the Speedup and Tune parameters just a bit. It really does make a difference. There are several free tape stop plug-ins (check KVRaudio.com) and there’s also Tape Stop from https://www.studiolinked.com. Yesssss!!!! This is dope!!! Question…Is there something like Veri-Fi(Pro Tools) in studio one? This is close to the effect but not the same. I just tried this and it works exceptionally well. Thanx or the tip Craig! Yes, the mixdown is opened in a new song and the processing done there. I’m not really clear on the workflow here. Is the intention that the stereo mix is exported and then opened into its own song? Or is this somehow done in the mastering phase (i.e., in a project)? Modulating up a half-step used to be common in pop music, not so much any more. Don’t know why! Using the kind of “tape speedup” also changes timbre and tightens timing, which may be advantageous for some songs. I also think people use this to skew their tune so it’s hard to make a dub (do we still use that word) or remix. An example is Childish Gambino – Redbone. It’s just not in tune. What I do’t understand is that if you want it to sound it more lively, just go up a 1/2 step or so. Unless we are into the cents. Definitely Craig on the microphone. Sorry folks, but the audio example that’s referenced wasn’t included – the PreSonus folks are off at Infocomm wowing the crowds, so I’m not sure when they’ll be able to add it in. The video link is to the finished song, not the “before and after.” Please check back next week if you want to hear the audio example.